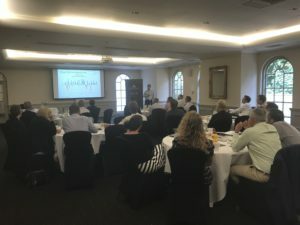 Hawksmoor recently held a presentation for the local business community at the Mercure Southgate Hotel in Exeter. CIO Private Clients & Head of Research Jim Wood-Smith entertained guests with his presentation ‘Snakes and Ladders’ – which covered a wide range of topics including a market review for the first half of 2018, the US dollar, US corporate earnings and corporate taxes, trade wars, oil price trends, emerging markets, bond yields and curves, Brexit and sustainability. If you are interested in attending any of the future Updates, please contact Business Development Manager Jill Gill.